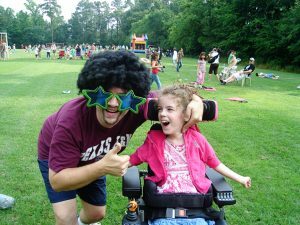 I promise this is not an article that is going to focus on the hardships of being a dad who struggles with a child with a disability. I’m also not going to sugar coat my world so you think its perfect, typical or even wonderfully exciting. How boring is that? However, when I made a wish upon a star to someday have a wonderful family and an exciting life, maybe I should have been a little more specific. Wonderful comes in many different ways. Gives new meaning to “Be careful what you ask for” huh? Our Megan was born in 1998. A traumatic delivery resulted in brain swelling. She was not accomplishing any age appropriate physical milestones that most babies did. However, it was obvious that she was responding appropriately to what we were saying. 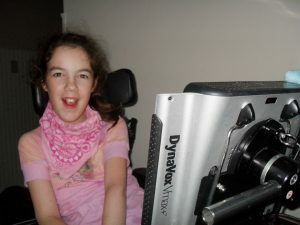 It took over 2 long years before we actually received the diagnosis of cerebral palsy. At first, I was fixated on how to FIX the PROBLEM. That’s what dads do, right? Procedures, therapies and medications… day after day, month after month… consumed our world for years. I was a results-oriented kind of guy. I believed that if we worked hard enough we could solve her issues. Her lack of muscle control while eating raised huge flags about her ability to be able speak as she got older. It didn’t surprise any of us that additional speech therapy was not keeping up with Megan’s efforts to try and communicate. She was so expressive, even without her voice. During her toddler years, we spoke to her in a complete conversational style and we would accomplish communications by paying attention to her eyes and facial expressions. We started to communicate with pictures taped to her tray and a head stick to point. Soon recordable buttons were integrated into her language. These gave her the ability to at least be in control of choosing when she wanted to say something that was recorded on a simple device. devices. After many trials, and persuading the public school to integrate it, Megan finally had a way to formulate her own thoughts and express herself without another person creating that thought for her. Her first device was a Dynavox 4 that she accessed with 2 separate switches mounted on her headrest. We were overjoyed! Being the technology geek, it was something I felt I could really use to connect more with her. Even though using switches was time consuming, it was amazing watching her personality come out. Because of this device, it was obvious that Megan could learn in a regular curriculum classroom. Her teachers were wonderful with accommodations, and her mother and I were very involved with nightly homework assignments. Fast-forward a few years. The next generation device let her access the internet, and it came with eye gazing technology. Megan’s world opened up to endless possibilities. Suddenly, she was able to speak quicker, with less effort, so her language and conversation exploded. The internet, not only let her mind expand, it created an open door for opportunities for her and I to connect. We discovered our mutual competitive streak that could be nurtured by playing each other in online chess and card games. We also have fun ordering food and groceries online with pizza being a favorite. We are in constant contact via text messaging, emailing, and social media. Funny. 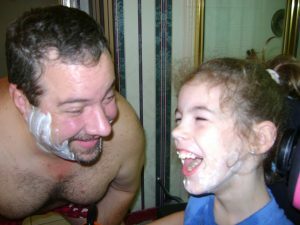 This is no different than our other teenage daughter without any disability. Megan and I both have mathematical minds, so the device allows us the opportunity to let me explain formulas to her and she can show her work. So, what started out as me being the dad that fixes the broken wheelchair, creates a ramp, downloads a program and the all important comedic stress reliever, I’m proud to say one of my greatest accomplishments in life is that I have played a part in my daughter becoming an independent woman who will not hesitate to take on the world. 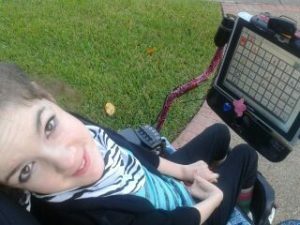 “Assistive technology has been the critical component that has connected me to my daughter”. She is 17 now and making plans for college. I am excited and terrified at the same time. Though, what parent isn’t? Every day is now consumed with identifying and accomplishing future challenges. 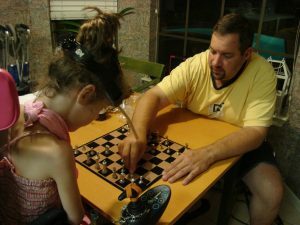 When asked to write this article, I pondered about my aspirations of fatherhood, then and now. I realized they haven’t really changed AT ALL. As a father, I still want my children to be happy and healthy, to challenge themselves, stand up for their beliefs, be independently minded, give back to the community that supports them, and most of all, keep love in their hearts. It’s wonderful knowing we live in a time where technology can give me just that. LOVE it! Thank you for sharing part of your story with us! What an honor it is to have walked a small part of your journey with you as neighbors and friends! I can NOT wait to see how the Lord works in Megan’s life over the coming years! I know it will be incredible! Great job! I’m very proud to be y’alls friend. Megan is such a blessing in my life, and to all of those around her. I couldn’t be more proud to call her my friend. With all of the unconditional love and support from her family and friends, the sky is the limit for this remarkable young lady!